The finishing step for wood floors after they have been sanded and stained is the polyurethane process. Polyurethane is a clear protecting agent that can be either oil- or water-based. Using the right roller head to apply polyurethane will give an even application to your hardwood floors. 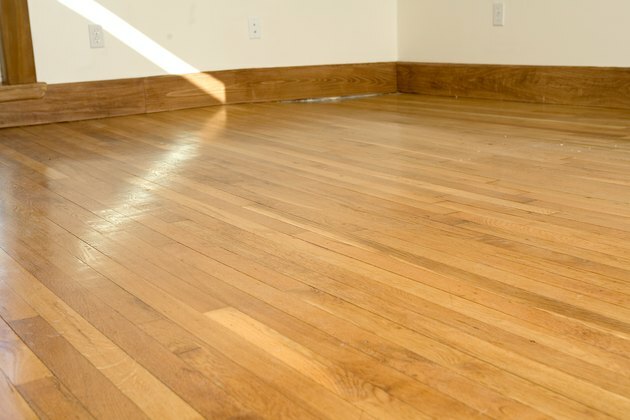 Polyurethane protects the finish of wood floors. There are three choices for applying polyurethane properly to a hardwood floor. For the areas around the edge of the floor where it meets the walls, use a soft-bristled paintbrush. To do the bulk of the floor, you can either use a roller with short fibers or a roller made from a material known as lambswool. One of the more significant challenges to applying polyurethane is preventing lint and dust from getting mixed in to the final surface. Short fiber paint rollers and lambswool paint rollers will give a smooth finish to your hardwood floor. Polyurethane is most effective when it is applied in multiple thin coats as opposed to one thick coat. One of the disadvantages of using a single thick coat is that polyurethane takes a long time to dry, so a thick coat will extend the drying time to three days or longer. According to G and S Wood Floors, three coats of polyurethane is sufficient for any floor. Since polyurethane has an extremely smooth finish, it can be difficult for the second and third coat to cure properly. The way that professional floor installers solve this problem is to do what is known as scoring the floor surface. In between coats of polyurethane, run a floor sander and a very fine grade of sandpaper over the dried layer. This gives the next layer a rough surface to bond to and can prevent the final polyurethane layer from peeling. When working with polyurethane, wear latex gloves and safety goggles to protect your skin and eyes from splatter. In addition, polyurethane fumes can be noxious when inhaled, according to This Old House. Ventilate the room thoroughly during the application and for 24 hours after the application is complete. How Do You Prep Your Lambs-Wool Applicator Before Finishing a Hardwood Floor?